The thin scattered clouds across the sky above a campground in Parc de la Plaisance in Quebec, Canada are beautifully tinged with pink and purple hues at sunset. An atmosphere of peacefulness surrounds Plaisance Park with a majority of the landscape being made up of farmland. During the Spring, the tranquility around Plaisance Park is broken by the sounds of thousands of Canada Geese, eventually bringing in the ducks, herons, ospreys and other birds for the summer. The park offers a variety of outdoor activities such as wildlife watching, camping, cycling, hiking, swimming, canoeing, fishing and kayaking. 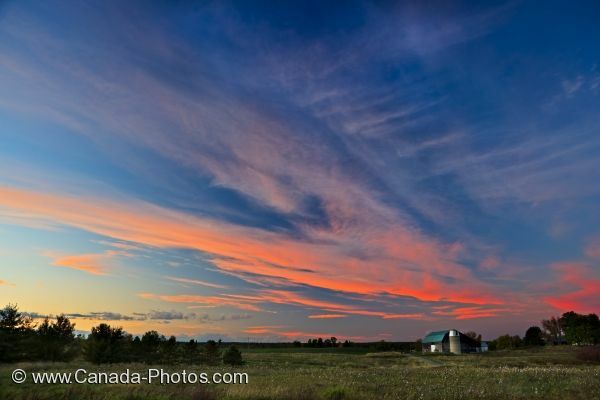 Photo of a beautiful sunset over a campground in Parc de la Plaisance in Outaouais, Quebec in Canada.